X-Men is a 2000 American superhero film based on the Marvel Comics superhero team of the same name, distributed by 20th Century Fox. It is the first installment in the X-Men film series, followed by X2 in 2003 and X-Men: The Last Stand in 2006 respectively. The film, directed by Bryan Singer and written by David Hayter, features an ensemble cast that includes Patrick Stewart, Hugh Jackman, Ian McKellen, Halle Berry, Famke Janssen, James Marsden, Bruce Davison, Rebecca Romijn-Stamos, Ray Park, Tyler Mane, and Anna Paquin. It depicts a world in which a small proportion of people are mutants, whose possession of superhuman powers makes them distrusted by normal humans. The film focuses on the mutants Wolverine and Rogue as they are brought into a conflict between two groups that have radically different approaches to bringing about the acceptance of mutant-kind: Professor Xavier's X-Men, and the Brotherhood of Mutants, led by Magneto. Development for X-Men began as far back as 1984 with Orion Pictures. At one point James Cameron and Kathryn Bigelow were in discussions. The film rights went to 20th Century Fox in 1994 and various scripts and film treatments were commissioned from Andrew Kevin Walker, John Logan, Joss Whedon, and Michael Chabon. Singer signed to direct in 1996, with further rewrites by Ed Solomon, Singer, Tom DeSanto, Christopher McQuarrie and Hayter in which Beast and Nightcrawler were deleted over budget concerns from Fox. X-Men marks the Hollywood debut of actor Hugh Jackman, who was a last-second choice for Wolverine, cast three weeks into filming. Filming took place from September 22, 1999 to March 3, 2000, primarily in Toronto. X-Men was released to critical praise and was a financial success, starting the X-Men film franchise and spawning a reemergence of superhero films. In 1944 German-occupied Poland, the child Erik Lehnsherr is separated from his parents upon entering a concentration camp. While trying to reach them, he causes a set of metal gates to bend towards him, as though attracted by a magnetic force, before being knocked out by guards. Decades later, U.S. Senator Robert Kelly attempts to pass a "Mutant Registration Act" in Congress, which would force mutants to publicly reveal their identities and abilities. Present are Lehnsherr, now known as Magneto, and the telepathic Professor Charles Xavier, who privately discuss their differing views on the relationship between humans and mutants. In Meridian, Mississippi, 17-year-old Marie D'Ancanto accidentally puts her boyfriend into a coma upon kissing him, which is caused by her superhuman ability to absorb the life force and mutant abilities of anyone she touches. In fear, Marie, now going by the name Rogue, runs away to Laughlin City, Alberta. While at a bar, she meets Logan, also known as Wolverine, who possesses superhuman healing abilities, heightened senses, and metal claws that protrude from his knuckles. While on the road together, they are attacked by Victor Creed / Sabretooth, another mutant and an associate of Magneto. Cyclops and Storm arrive and save Wolverine and Rogue and bring them to the X-Mansion in Westchester County, New York. They are introduced to Xavier, who leads a group of mutants called the X-Men, who are trying to educate young mutants on their powers, and stop Magneto from escalating the war with humanity. Senator Kelly is abducted by Magneto's allies Toad and the shapeshifter Mystique and brought to their lair, where Magneto uses Kelly as a test subject for a machine that artificially induces mutation. Kelly uses his new mutant abilities to escape imprisonment. After Rogue uses her powers on Wolverine, she is convinced by Mystique (disguised as classmate Bobby Drake) that Xavier is angry with her and she should leave the school. Xavier uses his mutant-locating machine Cerebro to find Rogue at a train station. Mystique later infiltrates Cerebro and sabotages the machine. At the train station, Wolverine convinces Rogue to stay with Xavier, but a fight ensues when Magneto, Toad and Sabretooth arrive and kidnap Rogue. Kelly arrives at Xavier's school, but dies shortly after due to the instability of his artificial mutation, which causes his cells to break down into a puddle of water. The X-Men learn that Magneto was severely weakened while testing the machine on Kelly, and realize that he intends to use Rogue's power-transferring ability so that she can power the machine in his place, which will kill her. Xavier attempts to use Cerebro to locate Rogue, but Mystique's sabotage causes him to fall into a coma. Fellow telekinetic/telepath Jean Grey fixes Cerebro and uses it, learning that Magneto plans to place his mutation-inducing machine on Liberty Island and use it to mutate the world leaders meeting for a summit on nearby Ellis Island. The X-Men scale the Statue of Liberty. Storm electrocutes Toad, and Wolverine stabs Mystique. Magneto transfers his powers to Rogue, and forces her to use them to start the machine. Cyclops dispatches Sabretooth with the help of Jean, who levitates his battle visor. Storm uses her weather-controlling powers and Jean uses her telekinesis to lift Wolverine up to Magneto's machine. Wolverine saves Rogue when Cyclops blasts Magneto out of the way, and destroys the machine. Wolverine touches the dying Rogue's face, and his healing abilities are transferred to her, causing her to recover. Professor Xavier recovers from his coma. The group learns that Mystique is still alive, and impersonating Senator Kelly. Xavier tells Wolverine that near where he was found in Canada is an abandoned military base at Alkali Lake that might contain information about his past. Xavier visits Magneto in a prison cell constructed entirely of plastic, and the two play chess. Magneto warns him that he will continue his fight, to which Xavier promises that he and the X-Men will always be there to stop him. A Canadian mutant who makes a living in cage fights and has lived for fifteen years without memory of who he is, apart from his tags marked "Wolverine" and an adamantium-encased skeleton (as well as adamantium claws). His mutant powers include enhanced, animal-like senses (enabling him to sense other people) and the ability to heal rapidly from numerous injuries, including the surgery that bonded the metal to his skeleton, which makes his age impossible to determine. A mutant Holocaust survivor who was once friends with Xavier (with whom he helped to build Cerebro), until his belief that humans and mutants could never co-exist led to their separation. His mutant powers include powerful magnetic fields, metal manipulation, and a sophisticated knowledge in matters of genetic manipulation, which he uses to plan a mutation of the world leaders to allow mutant prosperity. A white-haired mutant who teaches at Xavier's school. Although calm and caring, Storm has become bitter with other people's hatred for mutants, and while comforting a dying Senator Kelly, reveals that she sometimes hates humans because she is afraid of them. Her mutant power allows her to control the weather with her mind. The mutant doctor of the X-Mansion who is Cyclops's fiancée. Her powers include telekinesis and telepathy. Magneto's mutant loyal second-in-command, who seems completely facile with respect to modern technology. Her powers include altering her shape, voice and mimicking any human being, which is almost secondary to her role as "the perfect soldier". Additionally, Shawn Ashmore appeared in a minor role as Bobby Drake / Iceman, a mutant student at Xavier's School for Gifted Youngsters who takes a liking to Rogue. His powers include generating ice. David Hayter, Stan Lee, and Tom DeSanto make cameo appearances. George Buza, the voice of Beast in X-Men: The Animated Series, appeared as the truck driver who drops Rogue off at the bar at which Wolverine fights. Other cameo appearances include Sumela Kay as Kitty Pryde, Katrina Florece as Jubilee and Donald MacKinnon as a young Colossus sketching a picture in one scene. Gambit was considered for one of the students at the X-Mansion. Singer remembered, "We thought about Gambit as the young boy on the basketball field, but the feeling was that if he has the basketball and then releases it and it exploded, [then] people would be like 'What's wrong with those basketballs?'" Fox considered Brett Ratner as director, and offered the position to Robert Rodriguez, but he turned it down. Following the release of The Usual Suspects, Bryan Singer was looking to do a science fiction film and Fox offered him Alien Resurrection, but producer Tom DeSanto felt he would be more appropriate for X-Men. The themes of prejudice in the comic resonated with Singer. By December 1996, Singer was in the director's position, while Ed Solomon was hired to write the script in April 1997, and Singer went to film Apt Pupil. Fox then announced a Christmas 1998 release date. In late 1997, the budget was projected at $60 million. In late 1998, Singer and DeSanto sent a treatment to Fox, which they believed was "perfect" because it took "seriously" the themes and the comparisons between Xavier and Magneto and Martin Luther King and Malcolm X, unlike the other scripts. They made Rogue an important character because Singer recognized that her mutation, which renders her unable to touch anyone, was the most symbolic of alienation. Singer merged attributes of Kitty Pryde and Jubilee into the film's depiction of Rogue. Magneto's plot to mutate the world leaders into accepting his people is reminiscent of how Constantine I's conversion to Christianity ended the persecution of early Christians in the Roman Empire; the analogy was emphasized in a deleted scene in which Storm teaches history. Senator Kelly's claim that he has a list of mutants living in the United States recalls Joseph McCarthy's similar claim regarding communists. Fox, who had projected the budget at $75 million, rejected the treatment which they estimated would have cost $5 million more. Beast, Nightcrawler, Pyro, and the Danger Room had to be deleted before the studio greenlighted X-Men. Fox head Thomas Rothman argued that this would enhance the story, and Singer concurred that removing the Danger Room allowed him to focus on other scenes he preferred. Elements of Beast, particularly his medical expertise, were transferred to Jean Grey. Singer and DeSanto brought Christopher McQuarrie from The Usual Suspects, and together did another rewrite. David Hayter simultaneously rewrote the screenplay, receiving solo screenplay credit from the Writers Guild of America, while Singer and DeSanto were given story credit. The WGA offered McQuarrie a credit, but he voluntarily took his name off when the final version was more in line with Hayter's script than his. Russell Crowe was Singer's first choice to play Wolverine, but he turned it down, instead recommending his friend, actor Hugh Jackman for the part. Jackman was an unknown actor at the time, while a number of more established actors offered their services for the role, with Singer casting Dougray Scott. Part of Scott's contract included a sequel, but Scott backed out due to scheduling conflicts with Mission: Impossible II in early October 1999. Jackman was then cast three weeks into filming, based on a successful audition. Patrick Stewart was first approached by Singer to play Xavier on the set of 1997's Conspiracy Theory, which was directed by X-Men executive producer Richard Donner. James Caviezel was originally cast as Cyclops, but backed out due to scheduling conflicts with Frequency. James Marsden was unfamiliar with his character, but soon became accustomed after reading various comic books. Marsden modeled his performance similar to a Boy Scout. Eric Mabius expressed interest for the role of Cyclops. Angela Bassett was approached to portray Storm in late 1997, as was Janet Jackson. Anna Paquin dropped out of the lead role in Tart in favor of X-Men. Terence Stamp was considered for Magneto before Singer cast Ian McKellen, who acted in his previous film, Apt Pupil. McKellen responded to the gay allegory of the film, "the allegory of the mutants as outsiders, disenfranchised and alone and coming to all of that at puberty when their difference manifests," Singer explained. "Ian is an activist and he really responded to the potential of that allegory." The filmmakers decided not to replicate the X-Men costumes as seen in the comic book. Stan Lee and Chris Claremont supported this decision. Claremont joked, "you can do that on a drawing, but when you put it on people it's disturbing!" Producer/co-writer Tom DeSanto had been supportive of using the blue and yellow color scheme of the comics, but came to conclude that they would not work onscreen. To acknowledge the fan complaints, Singer added Cyclops' line "What would you prefer, yellow spandex?" – when Wolverine complains about wearing their uniforms – during filming. Singer noted that durable black leather made more sense for the X-Men to wear as protective clothing, and Shuler Donner added that the costumes helped them "blend into the night". Oakley, Inc. provided the red-lensed glasses worn by Cyclops, a customized version of the company's own X-Metal Juliet. Wolverine's claws required a full silicone cast of Hugh Jackman's arm, and over 700 pairs for Jackman and his stunt doubles. It took nine hours to apply Rebecca Romijn's prosthetic makeup. She could not drink wine, use skin creams, or fly the day before filming, because it could have caused her body chemistry to change slightly, causing the 110 prosthetics applied to her skin to fall off. Between takes, the makeup department kept Romijn isolated in a windowless room to ensure secrecy. Romijn reflected, "I had almost no contact with the rest of the cast; it was like I was making a different movie from everyone else. It was hell." On June 1, 2000, Marvel published a comic book prequel to X-Men, entitled X-Men: Beginnings, revealing the backstories of Magneto, Rogue and Wolverine. There was also a comic book adaptation based on the film. A console video game, X-Men: Mutant Academy, was released on July 6, 2000 to take advantage of the film's release, featuring costumes and other materials from the film. On its opening weekend in North America, X-Men earned $54,471,475 in its opening weekend, a record for comic book films that far. The film eventually grossed $157,299,717 and made $139,039,810 in other countries, coming to a worldwide total of $296,339,527. X-Men was the ninth highest-grossing film of 2000. It is the lowest-grossing film in the series. The success of X-Men (alongside Blade) started a reemergence for the comic book and superhero film genre. The film received positive reviews. Based on 166 reviews collected by Rotten Tomatoes, 81% were positive. The site's critical consensus reads: "Faithful to the comics and filled with action, X-Men brings a crowded slate of classic Marvel characters to the screen with a talented ensemble cast and surprisingly sharp narrative focus." Metacritic collected an average score of 64/100 from 33 reviews indicating "generally favorable reviews". X-Men was originally released on VHS and DVD in November 2000, to take advantage of Thanksgiving in the United States. In its initial home video weekend, the film earned $60 million in rentals and direct sales, making it earn more than all films in theaters outside from leader How the Grinch Stole Christmas. X-Men finished 2000 as the seventh highest-grossing home release of the year with $141 million, with 78% being earned through sales. 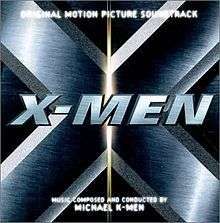 A new two-disc DVD version was issued in 2003 in anticipation to the theatrical release of sequel X2, titled X-Men 1.5. The DVD includes the theatrical version of the film along with the option to add deleted scenes, and several new additional features. After the film's critical and financial success, a series of films followed starting with, X2 in 2003. ↑ "X-MEN (12)". British Board of Film Classification. July 13, 2000. Retrieved April 29, 2016. 1 2 3 "X-Men". Box Office Mojo. Retrieved August 7, 2008. 1 2 "2000 Worldwide Grosses". Box Office Mojo. Retrieved August 7, 2008. 1 2 3 4 5 6 7 8 9 10 Hughes, David (2003). Comic Book Movies. Virgin Books. pp. 177–188. ISBN 0-7535-0767-6. 1 2 3 4 5 "X-Men Archive". Comics2Film. Retrieved August 9, 2008. ↑ "The SuperHeroHype Forums - View Single Post - The Official Colossus/Daniel Cudmore thread". Retrieved September 30, 2014. ↑ Tim Molloy (2012-03-25). "Chris Claremont's Dream X-Men Movie: James Cameron, Kathryn Bigelow, and Bob Hoskins as Wolverine". TheWrap.com. Archived from the original on 2016-05-09. Retrieved 2014-10-11. ↑ "Marvel characters holding attraction for filmmakers". Variety. December 9, 1992. Retrieved August 9, 2008. 1 2 3 4 5 6 7 Jeff Jensen (July 21, 2000). "Generating X". Entertainment Weekly. Retrieved August 9, 2008. ↑ Steve Daly (September 29, 1995). "Deadly Done Right". Entertainment Weekly. Retrieved May 22, 2007. ↑ Andrew Kevin Walker (June 7, 1994). "X-Men First Draft". Simplyscripts. Retrieved July 13, 2007. ↑ Galloway, Stephen; Donna Parker (1995-03-30). "4 top ICM agents walk, undertake own Endeavor". The Hollywood Reporter. Nielsen Company. ↑ "In Focus | August/September 2005 | Serenity Now! Uncut". Natoonline.org. Retrieved October 20, 2008. ↑ Craig Seymour (May 10, 2000). "X-Man Out". Entertainment Weekly. Retrieved May 22, 2007. ↑ Tasha Robinson (September 5, 2001). "Interview - Joss Whedon". The A.V. Club. The Onion. Retrieved November 21, 2009. ↑ Kim Voynar (July 9, 2006). "X-Men and Fantastic Four: What Would Chabon Have Written?". Cinematical. Retrieved September 23, 2007. ↑ Michael Fleming (2005-06-05). "New master for mutants". Variety. Retrieved 2014-10-11. ↑ "The Total Film Interview-Robert Rodriguez". Total Film. October 1, 2003. Retrieved October 7, 2007. ↑ Michael Fleming (April 14, 1997). "A Mania For Marvel". Variety. Retrieved March 25, 2008. ↑ Anita M. Busch (December 10, 1996). "Singer set to direct Fox's Men". Variety. Retrieved March 25, 2008. ↑ Dan Cox (July 29, 1998). "Col inks Solomon, Lynn". Variety. Retrieved March 25, 2008. ↑ Chris Petrikin (January 20, 1999). "Rice gets Fox promotion". Variety. Retrieved March 25, 2008. ↑ Borys Kit (August 13, 2009). "McQuarrie to pen 'Wolverine' sequel". The Hollywood Reporter. Archived from the original on January 10, 2010. Retrieved August 13, 2009. ↑ Hugh Armitage (2012-11-24). "Hugh Jackman: 'Russell Crowe got me my Wolverine role'". Digital Spy. Retrieved 2014-09-23. ↑ Michael Fleming (May 27, 1999). "Wahlberg a headbanger? ; X-Men gets man". Variety. Retrieved March 25, 2008. ↑ Michael Fleming (June 15, 1999). "X marks the Scott for Singer-helmed Fox pic". Variety. Retrieved March 25, 2008. ↑ Michael Fleming (October 7, 1999). "NL scores Demme's Blow". Variety. Retrieved August 9, 2008. ↑ Chris Petrikin (October 11, 1999). "Aussie Jackman jumps into Singer's X-Men pic". Variety. Retrieved August 9, 2008. 1 2 Geoff Boucher (March 18, 2010). "Bryan Singer on 'X-Men: First Class': It's got to be about Magneto and Professor X". Los Angeles Times. Retrieved March 20, 2010. ↑ Jeff Otto (October 14, 2004). "IGN Interviews Jim Caviezel". IGN. Retrieved August 8, 2008. ↑ Scott Holleran (June 2, 2006). "Close-Up: X-Men's James Marsden". Box Office Mojo. Retrieved August 9, 2008. ↑ Janet Jackson (February 22, 2008). "Janet Jackson, personal choice as 'Storm'". Total Request Live. Retrieved March 22, 2009. ↑ Vanessa Torres (October 18, 1999). "Swain signs to top Tart for Interlight". Variety. Retrieved August 9, 2008. ↑ Eric Vespe (December 11, 2008). "Bryan Singer and Quint talk Nazis, Tom Cruise, Terence Stamp, Valkyrie plus an update on Superman!!!". Ain't It Cool News. ↑ Chris Petrikin (February 9, 1999). "Marvel, Fox pact for pix". Variety. Retrieved March 25, 2008. ↑ Chris Petrikin (August 19, 1999). "Fox shifts actioner X-Men to June". Variety. Retrieved March 25, 2008. ↑ Josh Walk (August 19, 1999). "Getting the 'Shaft'". Entertainment Weekly. Retrieved May 22, 2007. ↑ Chris Petrikin (September 16, 1999). "Fox shuffles X-Men and Anna". Variety. Retrieved August 9, 2008. ↑ Greg Dean Schmitz. "Greg's Preview - X-Men". Yahoo!. Archived from the original on August 21, 2007. Retrieved August 9, 2008. ↑ "X-Men filming locations: Hamilton, Ontario". Movie Locations. Retrieved August 9, 2008. 1 2 3 Scott Chitwood (February 10, 2000). "X-Men's Sabretooth Scares Crap out of Kid, Toronto Set Visit, Wolvie Love Triangle, New Pics, & More". IGN.com. Archived from the original on April 14, 2016. Retrieved August 10, 2008. 1 2 Burlingame, Jon (July 23, 2000). "The Sound of Work Leaving L.A.". Los Angeles Times. Archived from the original on March 2, 2016. Retrieved June 4, 2016. ↑ Scott Chitwood (February 10, 2000). "DeSanto talks about X-Men costumes". IGN. Retrieved August 10, 2008. ↑ Suiting Up. X-Men First Class Blu-ray: 20th Century Fox Home Entertainment. 2011. ↑ Kris Abel (October 26, 2006). "Making Wolverine's Claws". CTV. Archived from the original on 2007-07-13. Retrieved October 26, 2006. ↑ Rob Worley (April 21, 2003). "Bryan Singer's Mutant Agenda". Comic Book Resources. Retrieved March 9, 2008. ↑ Marc Graser (December 8, 1999). "Seven f/x houses will share X-Men duties". Variety. Retrieved August 9, 2008. ↑ Piers Bizony (2001). Digital Domain: The Leading Edge of Visual Effects. Billboard Books. p. 143. ISBN 0-8230-7928-7. ↑ Bill Ramey (February 12, 2006). "Superman-on-Film". Batman-on-Film. Archived from the original on October 13, 2008. Retrieved May 22, 2007. ↑ Marc Graser (June 21, 1999). "Ottman adds helming other duties". Variety. Retrieved March 25, 2008. ↑ John Ottman on Urban Legend: Final Cut Archived March 10, 2016, at the Wayback Machine. ↑ "X-Men: Beginnings (Paperback)". Amazon.com. Retrieved February 9, 2008. ↑ "X-Men: The Movie (Paperback)". Amazon.com. Retrieved February 9, 2008. ↑ "X-Men". Rotten Tomatoes. Retrieved August 31, 2015. ↑ "X-Men (2000): Reviews". Metacritic. Retrieved August 8, 2008. ↑ Kenneth Turan (July 14, 2000). "Gen-X". Los Angeles Times. Retrieved August 8, 2008. ↑ "X-Men". James Berardinelli. Retrieved August 8, 2008. ↑ Desson Thomson (July 14, 2000). "X-Men: Tasty but Not Filling". The Washington Post. Retrieved August 8, 2008. ↑ Roger Ebert (July 14, 2000). "X-Men". Roger Ebert. Retrieved August 8, 2008. ↑ Peter Travers (December 10, 2000). "X-Men". Rolling Stone. Retrieved August 8, 2008. ↑ Conrad, Jeremy (January 24, 2003). "X-Men 1.5". IGN. IGN Entertainment, Inc. Retrieved 2014-10-12. 1 2 Boss, Nate (April 30, 2009). "X-Men Blu-Ray". High Def Digest. Internet Brands, Inc. Retrieved 2014-10-12. The entire supplement package is a rehash from the 'X-Men 1.5' DVD release, so much so that the features function the exact same way, as Fox didn't take the time to create a Picture in Picture track. Wait, I take that back....they did. It's on the UK version of the disc. ↑ Gould, Chris. "Review: X-Men Trilogy (UK - BD)". DVD Active. Retrieved 2014-10-12.